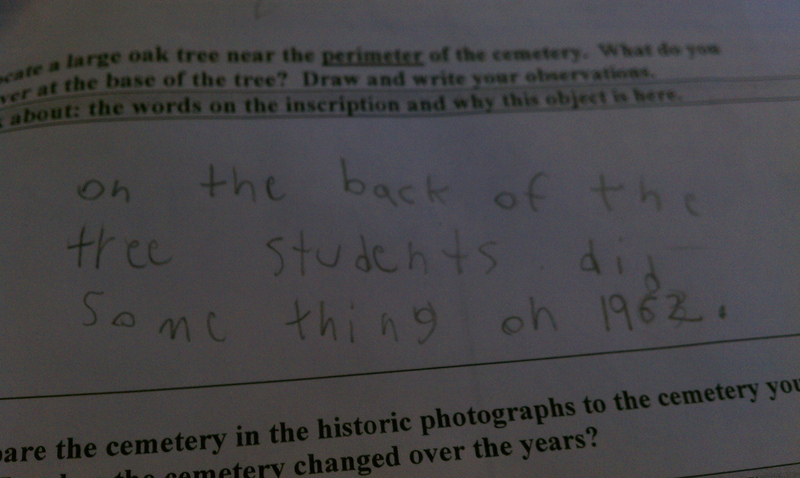 PS 48 student independently discovers that her school helped save Drake Cemetery from destruction in the 1960s. Engage students in authentic, hands on historical research aligned to literacy and social studies standards. Teaching social studies revolving around the HPSBG concepts and the Joseph Rodman Drake Park, namesake of PS 48. Always in development, here are some exemplary literacy and social studies activities revolving around the Project's major educational themes. Note: you can use lessons developed by the New York State Social Studies Core Curriculum or the New York City Social Studies Scope and Sequence as a framework and/or model for our local curriculum. The National Archives has resources for using primary sources in the classroom, including tips on introducing documents to students and graphic organizers for assisting students in learning information from the documents. These can be used to aid lesson development. Additionally, check out available hard copy resources in the PS 48 Hunts Point Slave Burial Ground Learning Center. Activating Prior Knowledge This lesson is a pre-assessment to measure how much information students currently believe that they know about the neighborhood, as well as looking for a hook to the historical underpinnings of the HPSBG Project. Using Historic Newspapers Students learn how to analyze a newspaper account to learn information about a historical time period, as well as ask questions that leads to further investigation. Using Primary Source Documents This lesson introduces students to strategies for investigating primary source documents by using critical HPSBG documents, such as historic photographs, maps, and census data. History of Hunts Point for the Primary Grades Students will work and travel in small “student research groups” to analyze various historic Hunts Point images. They will collect “research notes” at each “research station.” This lesson culminates in a class history book. Drake Cemetery Initial Field Investigation Use this field experience data gathering sheet at Joseph Rodman Drake Park in order to develop observational and analytical skills while developing social studies and science content and vocabulary related to HPSBG. Discovering the Site Investigation Students engage in an online or offline investigation of critical documents, making connections between information learned in photos, historical texts, maps and census records, with a final project where they "prepare their findings" to share with the local community. Remember the Forgotten Community Gathering This is actually a exemplar in gathering community stewards together of all ages for a common cause. As en educator, developing a commemoration ceremony involves having students research who to conduct outreach with, who to recruit to volunteer their time, how to connect media and social networks, and so on. These are all learning opportunities that connect literacy with social activism for a real world purpose. Investigating Cemetery Headstones Students will learn how to conduct an inventory of the headstones in Drake Park. This will include geologic investigations (science), document each gravestone through photographs (literacy, technology and art), mapping their locations (literacy, mathematics, geography, technology), and transcribe what it located on the inscriptions (literacy, art). the headstones and lives of those buried in the Drake Cemetery. This unit is based on the ﻿Spring 2016 PS 48 after school program for English Language Learners (ELLs﻿). Developing a Park Needs-Assessment Students engage in activities in Drake Park that focus on assessing the existing amenities in their local park, and drawing up recommendations for park improvements. The needs-assessment culminates in students using graph paper (4 piece of 8.5" x 11" grid paper stitched together to create a large rectangle) to independently and collaboratively re-design that park based on their recommendations. The results are then shared with NYC Parks through the development of a video that advocates for their improvements. New Yorkers for Parks has developed a great resource for teaching youth to advocate for their local parks that is very useful. Student recommendations for Spring 2017 included trash cans, park benches, picnic tables, playground equipment, a podium and/or stage for presentations and movies, memorial for HPSBG, dog waste baggies, water fountains, 'curb your dog' signs, and a bathroom. How Can I Improve My Park? This resource was developed by New Yorkers for Parks to empower youth to be advocated for their communities, to use their voice, and improve the parklands around them. NYC Landmarks Preservation Lesson Students learn about the process for protecting and preserving sites of historical and cultural significance for New York City's heritage. Additionally students become civically engaged advocates by participating in developing the actual application process. Return to HPSBG Curriculum Homepage.